The Strategy: Define your terms: Know your mission; educate your stakeholders about what advocacy is… and isn’t. In this month’s blog from our Local Advocacy Network, advocates from the San Luis Obispo Alliance for Arts Education explain how and why they worked with the district superintendent in Paso Robles in this brief video blog. The Challenge: How to build a district wide arts program starting now. The Strategy: A district arts plan builds broad support and maps a path for incremental, but sustained growth. The Story: California’s state education code requires that students receive K-12 instruction in visual arts, music, theater and dance. Yet, during years of tough financial times, many schools were forced to cut their arts programs. During the lean years, advocates in Orange County (OC) undertook a systematic effort to pass district arts plans that means as new funding comes in, both a commitment and a plan are in already place. Each June, every school district in California is required to submit a three year Local Control Accountability Plan (LCAP) as part of the state's new school funding formula. New resources from the California Alliance, Arts for LA and Arts for All offer a look at trends in the ways that districts are investing in arts education and a closer look at a few strong examples from actual LCAPs and how advocacy played a role in these districts. Arts for LA and LA County Arts Commission Arts for All have released findings from a research initiative analyzing all 81 school district LCAPs in LA County. 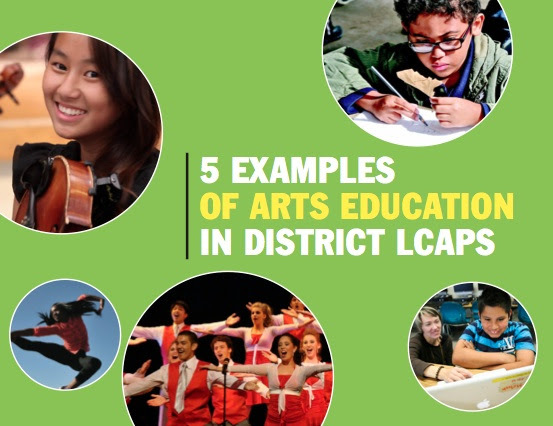 The research provides baseline information on the number of districts that included the arts in their LCAPs, which state priority areas are linked to the arts, and the types of arts programs being funded at schools. The findings will also provide a broad sense of trends for how arts education strategies are being used by school districts. Challenge: Persuade city officials to introduce and support a ballot initiative to fund arts education, libraries and sports. Strategy: The San Francisco Alliance for Arts Education authored a white paper that decision-makers clear, sound arguments for amending a funding policy and putting it on the November 2014 ballot. We’re kicking off 2015 with a statewide convening of CREATE California to ignite collective impact and expand arts and creativity in California schools. Join us in Oakland on January 30 & 31, 2015 for workshop sessions, policy briefings and conversations to open up new opportunities for collaboration. We will be joined by Governor Jerry Brown, Apple University’s Randy Nelson, as well as students from the Oakland School for the Arts and the San Francisco Student Latin Jazz Youth Ensemble. The Challenge: How to increase access to arts education in a large district with limited opportunities for arts. The Strategy: Bring solutions to your local school board. The Story: The Santa Cruz County Alliance for Arts Education, launched in 2012, has an ambitious goal - to advocate for arts education for all students in every school community in Santa Cruz County. They began their work by focusing on the county’s largest district, which had very limited arts education offerings. The Santa Cruz Alliance knew that their best chance to make an impact within the district was to advocate for the inclusion of arts in that district’s new Local Control Accountability Plans (LCAP). “We did so by building relationships with school board members, coordinating presenting materials at school board meetings and town hall planning sessions, defining a clear and appropriate ask, and following up and celebrating the progress made,” says Sarah Brothers, the Arts Education Manager for the Arts Council Santa Cruz County and leader for the Santa Cruz County Alliance for Arts Education (SCCAAE). With the passage of the Local Control Funding Formula (LCFF), local school boards have been given authority to set the priorities and funding allocations for their districts, which makes building relationships with your local school board members more important that ever. Now that the elections are over, a great way to start a relationship with the winning candidate is to write her or him a congratulations letter. It doesn’t matter who you voted for, now is the time to reach out and start building bridges to ensure supporting arts education is a part of their plans. A congratulations letter is a good way to let your voice be heard while starting off on a positive note. Read Story about Why Congratulate New Candidates?